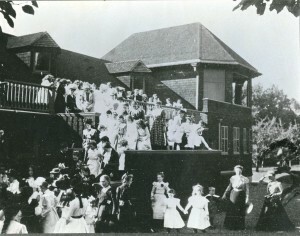 Completed in 1894 for Helen Miller Gould, the fourth owner of Lyndhurst, the bowling alley and recreation pavilion functioned as social gathering place, vocational school, and riverside respite for children and families from the surrounding villages as well as for soldiers and sailors returning from World War II. Located less than 500 feet from the banks of the Hudson River with sweeping views of the Tappan Zee Bridge and Palisades, this 5,000-square-foot building is an amazing example of a purpose built structure that enhanced country life in the late 19th century. This shingle-style bowling alley originally had a western red cedar shingle roof that was applied over a solid roof deck rather than traditional spaced sheathing. 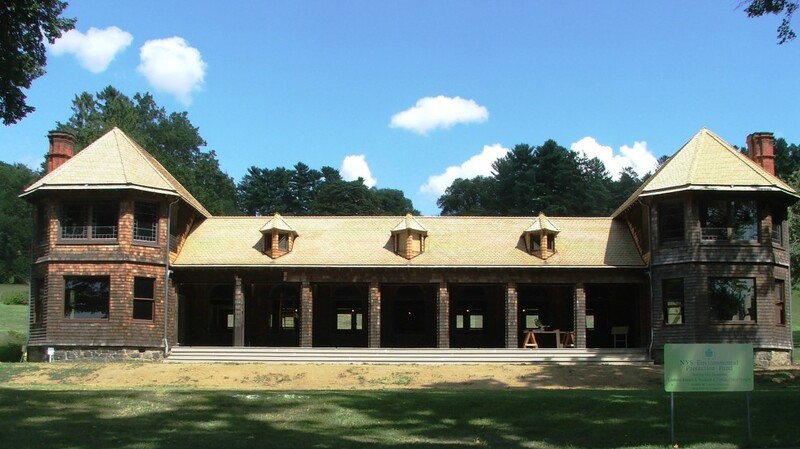 As there are no records of who designed or constructed the building for Gould, we are left to wonder if a slate roof was planned for (as is found on the majority of outbuildings at the site) and then reconsidered during construction, or if it was a regional custom to install the shingles directly on the wood deck. Twenty years ago, a new red cedar roof was installed; however, it began showing signs of failure less than 10 years after it was installed. It was time to install a new roof on the bowling alley. 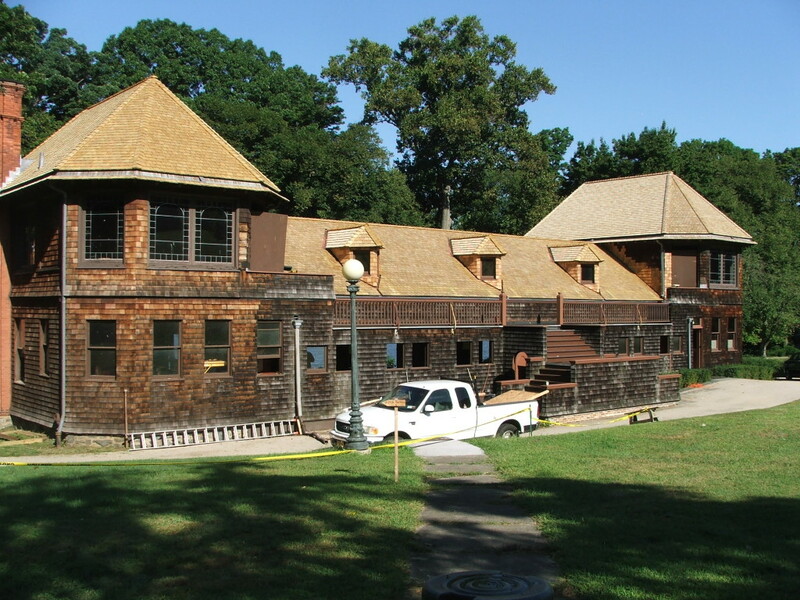 Lyndhurst and the architect Stephen Tilly sought the input and guidance from the Cedar Shake and Shingle Bureau (CSSB) to develop specifications for replacing the roof. The bureau, a nonprofit organization founded 100 years ago, promotes cedar roofing and side wall products. Composed of manufacturers, the CSSB is the leading industry authority on technical aspects of cedar shingle use and installation and is responsible for educating the general public and as well as building code officials around North America. 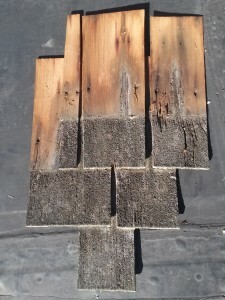 In an effort to install the best roof possible, the old shingles were sent to a wood scientist named Ron Anthony of Anthony & Associates in Fort Collins, Colorado. He concluded that the extreme environment of the riverside location coupled with the solid roof deck, which prevented the back of the shingle from drying, as causal factors for premature failure. The deterioration of the shingle was so great that he thought the roof had been power washed—which it had not been. 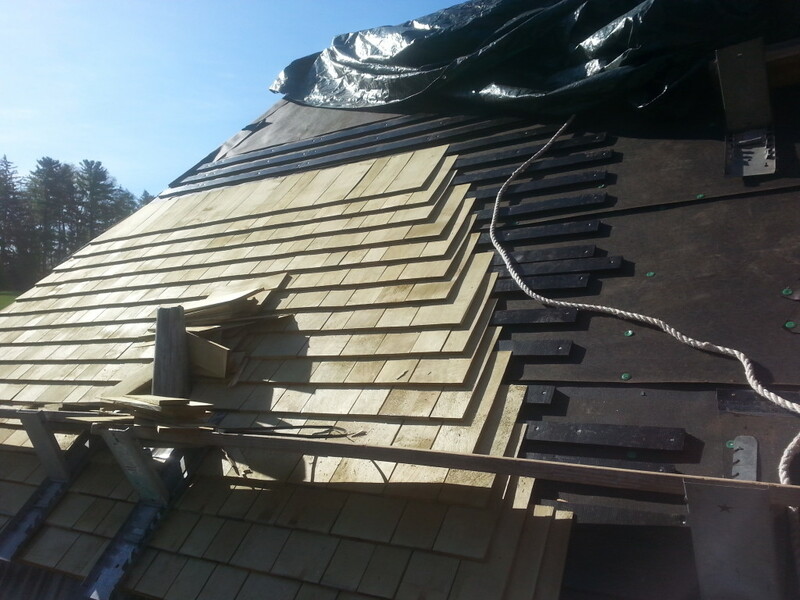 For this reason, Lyndhurst selected Alaskan yellow cedar for the roofing material. Yellow cedar grows only in the coastal mountains of Washington, British Columbia and Alaska. These higher elevations and northern latitudes have short growing seasons, resulting in very tight annual growth rings. This makes for a strong, dense wood, one-third heavier than traditional western red cedar and similar to Douglas fir in structural strength. Yellow cedar also has a high content of natural oils that effectively inhibit the agents of decay. Historically, this wood has also been used extensively for boat building, water reservoirs, gutters, beams and bridge stringers. It has many characteristics that make it a valuable species worldwide for lumber products where strength and natural resistance to decay are desired. It is warranted to provide a 40-year service life, and with a pressure-treated coating, 50 years. The next step to fabricating a durable wood roof system for our application was to introduce a product that would mimic the historic open sheathing missing from our project. To that end we selected Cedar Vent®, a product that comes in strips and gets installed directly to the roof deck. It is a high density, non-compressive plastic that is corrugated. 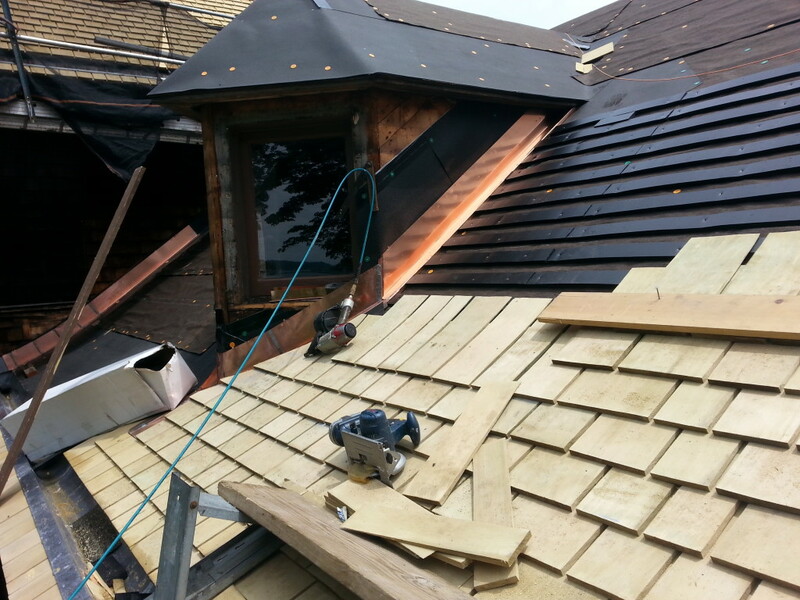 The air passes from the eve edge of the roof to the ridge achieving a continuous airflow to the back of the shingle, allowing it to dry properly. Before finalizing its inclusion in our spec, we checked with both the cedar manufacturer and the cedar preservative treatment company as well as the CSSB Technical Installation expert to be sure that use of this product would not void any warranties as this product is somewhat new to roofing but has been used on side walls for more than a decade. Once it was cleared we had our recipe for success. Add a dash of contractor education and we now have a perfect sandwich that will provide years of service and fade to the same silver color as western red cedar without the inherent problems of cupping and curling as it comes from new growth western red cedar trees. We invite you to stay tuned to this unique restoration project as significant interior restoration work has been completed. And while some work remains, we are on track to open the bowling alley to the public next summer. Krystyn Hastings-Silver is the associate director of Lyndhurst and is in charge of capital projects and the collections. Before joining the National Trust in 2005, she oversaw the restoration of numerous National Landmark sites such as the Mark Twain House, the Hill-Stead Museum and the Chick Austin House owned by the Wadsworth Athenaeum in Hartford.